Just a small blog this time but if you're worried about how your cat will react to your new baby then hopefully this life-hack will blow your mind! Our cat is a grumpy sod. Like most cats, she likes to sleep, she likes her meals on time and she is a total princess, but I wouldn't have her any other way. 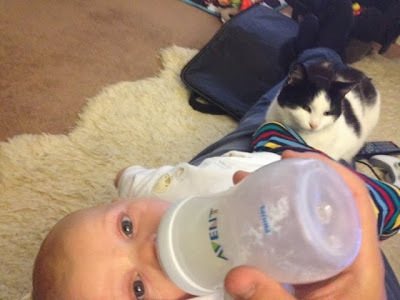 She hates other cats and looks annoyed with the world most of the time, so I was a bit concerned that bringing a new baby into her territory was going to cause problems. But how wrong I was. I had read a tip somewhere, that there is one really simple trick. It works like a charm. I imagine you could use it on territorial dogs as well. But I've only road tested it on a cat so don't take my word for it. Firstly, we made sure the nursery was pretty much an open house before C was born. She was welcome to inspect the decorations and each new item as it was installed. This was to remove the mystique and make her feel comfortable with the changes to her house. Any time she was sniffing around outside, I would let her in to approve of the things that were happening, and she would soon get bored and wander off. But the really amazing solution that I keep referring to is one of the weirdest, and most bizarre things I've seen in a long time. The night of C's birth I had to go home, as I wasn't allowed to stay overnight. Before I left the hospital I grabbed the top that H had been wearing throughout her labour, the very same clothes he had rested on, and also the woolly hat that he had worn. I got home and gave them to the cat. She went crazy, it was like dubstep music was flowing through her veins and she was being fed an intravenous drip of pure catnip. Rolling on the floor, and purring louder than I've ever heard her in her life, she played around with the clothes enjoying the scent of the new baby and really rubbing her face in it. It was like she understood. I left her to it for about half an hour, and left the clothes in the hallway overnight. When I came back the next day I brought a new item of clothing with me, with the same results but only she was a bit more disinterested this time. The next day, we brought our baby home and she didn't kick up a fuss at all, it was like she already knew what was happening, and understood he was an important part of the family, and not at all threatening to her. Fast forward seven months and they are great friends. I'm sure I'll write about this another time, as he is obsessed with her and it can be very amusing. So there you go, if you're ever wondering how to introduce a baby to your pets, just give this a whirl, and let me know how you get on!